Chester Gas installs gas fires. New gas fire installation is specialist work - we supply and fit gas fires from most of the main manufacturers, and we always install fires to manufacturer's requirements and gas safety standards. Whether it is a new gas fire or a replacement gas fire, we can carry out a survey before installing a fire to check that your fireplace, flue, and ventilation are suitable. We provide a fixed price quote for the work and arrange fitting at a time and date that suits you. If you want a new gas fire, then call us now on 07779 646 646. We give you a total price to supply, fit and commission your new gas fire so it works safely and economically. Fitting a fire is a specialist task, and finding a suitable fire for your fireplace and hearth, with the correct flue type, ventilation, safety devices and type of controls is something that you need to get right. For a fixed fee, currently only £20, we will come and carry out a survey of your fireplace, check your flue and ventilation, advise you of your options, and give a complete price quote for the work. This survey fee will then be refunded against the cost of any work that we carry out. Besides gas fires, we supply and fit fireplaces, surrounds and hearths to professional standards and suitable for your fire. Contact us for more information. We aim to always give quotes that are complete, accurate and competitive. 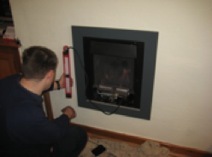 During the survey, we may find work that needs to be done before your choice of fire can be fitted, for example to the fireplace, chimney, flue terminal, ventilation or air supply. We will always endeavour to highlight this and include it in the quote. However, there are some assumptions that we have to make for the quote - sometimes it is only when a fireplace is opened out or a new fire is actually fitted in place that some problems can be seen. If this is the case, then there may be an additional charge for any remedial work that needs to be done. However, this is relatively rare and we will inform you of any difficulties that we come across, your options and any costs, as soon as possible in the process. Unfortunately, we do not install second-hand gas fires.